Fate Norris, of Dalton, Georgia, the one-man wonder, who plays six individual instrument in an individual band, will also furnish entertainment. Mr Norris has in his band two guitars, bells, bass fiddle, fiddle, and mouth harp. He devoted seventeen years to mastery of his art. Fate Norris was there too, had a musical soapbox – made out of soap boxes with a pocket knife, and strings from mandolins, guitars, fiddles, autoharps. Had pedals and knee pads. Played two instruments with his feet; played a mouth harp. 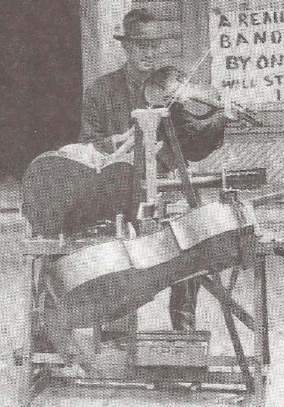 There are no recordings of Fate Norris’ one-man band, only these descriptions and a few photographs, one of which shows him sitting before his contraption, fiddle in hand, on a sidewalk in front of a hand-written sign reading: ‘A real string band played by one man will start at 12 pm’. The photograph reproduced here provides a better view of Norris’ invention, its unusual arrangement of guitars, a large cogwheel, and the three pedals for his left foot and one for his right. He’s added kazoo to his fiddling and looks as if it is one minute past noon and he is about to launch into his first number. Another newspaper article about Norris’ appearance in Nashville adds: ‘It required fifteen years, Mr Norris says, for him to perfect his performance’.